Stewart Conn was born in Glasgow in 1936, and grew up in Kilmarnock. Though his father was a minister, one branch of the family were farmers, and much of his early poetry is distinctive for its Ayrshire farm settings, animals and people – almost mythic figures seen through a boy's eyes – and its depiction of a way of life since virtually vanished. He subsequently lived in Glasgow's west end, a stone's throw from the Botanics and the University. During these years much of his work depicted figures, often familial, against a changing city background; or else responded to a sense of place, both in this country and abroad. In 1977 he was transferred, as BBC Scotland's head of radio drama, to Edinburgh where he has since lived and worked. In 1992, shortly after receiving a gold medal award at the New York Radio Festival for his production of John Purser's play Carver, he left to become a freelance writer. A selection from his books up till then – Stoats in the Sunlight (1968), An Ear to the Ground (1972, Poetry Book Society Choice) and Under the Ice (1978) – was the basis for In the Kibble Palace (1987). Much of The Luncheon of the Boating Party (1992), its title sequence giving voice to figures in Renoir's painting, focuses on the nature and power of art. In the Blood (1995) reverts to his Kilmarnock days, the Upper Clyde and the Ayrshire coast; while At the Aviary (1995) draws on brief visits to South Africa and to Botswana's magical Okavango Delta. Stolen Light: Selected Poems (1999, shortlisted for Saltire Book of the Year) aligns poems from these volumes with new work. Also that year poems by him and Anna Crowe, with versions in Catalan, appeared in L'ànima del Teixidor (Edicions Proa, Barcelona). Distances (2001) contains short memoirs of George Mackay Brown and Iain Crichton Smith; observations on Alasdair Maclean and W. S. Graham; and prose pieces on Ayrshire, the Forest of Ettrick, and being with an African theatre troupe rehearsing in the bush. These are embroidered with poems, vignettes, and wry thoughts on the writer's lot. In 2002 he was appointed Edinburgh's inaugural Makar, where his role was to raise the profile of the city in poetry and vice versa. His own commissions included poems on the unveiling of Robert Fergusson's statue in the Canongate and for the city's UNESCO World City of Literature presentation, and a street installation marking the revigoration of the North Holyrood site. He edited The Hand that Sees to mark the quincentenary in 2005 of the RCSEd and, with Nancy Somerville, an illustrated anthology for children Goldfish Suppers. His three-year tenure inspired a sequence conjuring up Roull of Corstorphin, elegised in Dunbar's great Lament, which became central to Ghosts at Cockcrow (2005). A continued emphasis on human transience and the interplay of our affections marked the pamphlet The Loving-Cup (2007), much of which reappeared in The Breakfast Room (2010), the 2011 Scottish Mortgage Investment Trust Poetry Book of the Year. His latest publication is a second Mariscat pamphlet, Estuary; while The Touch of Time: New and Selected Poems is due from Bloodaxe early in 2014. His published plays include The King, The Burning, The Aquarium, Play Donkey, Herman and Hugh Miller; while a revised version of I Didn't Always Live Here was brought out to coincide with the play's revival at the Finborough Theatre, London in March 2013. His adaptation of George Mackay Brown's Greenvoe, with music by Alasdair Nicolson, was broadcast from the St Magnus Festival, in Orkney; while Four Folk Tales, set by the same composer, were performed in an LSO Discovery Season at St Luke's, Covent Garden. He has awards from (among others) the Eric Gregory Trust, Scottish Arts Council, Society of Authors, and Poetry Book Society. 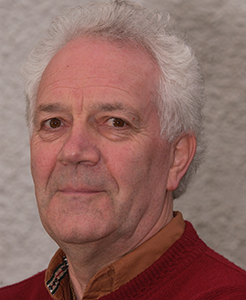 He has been the recipient of a Thynne travel scholarship from the English-Speaking Union; and he was the inaugural holder of the Institute of Contemporary Scotland's Iain Crichton Smith Award for services to literature. He is a fellow of the RSAMD and an honorary fellow of the ASLS.